NiceDayOut: Not going to be geocaching much from now on so archiving. The 'official' Church Micro for St Andrew's Church, Impington. Note that there is another cache (Impington Hall) placed opposite the FRONT of the church. This Church Micro is placed on the road that runs behind. You are looking for a bison tube. 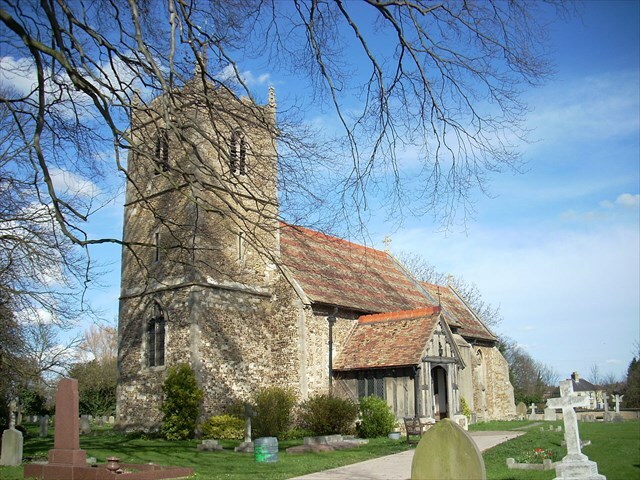 The earliest known date for Impington is AD 991, when the manor was given to the Monastery at Ely by Duke Brithnoth. The name is said to derive from a Saxon tribe, "Empings". The village "Epintone" is in the Domesday Book (pop. 143). The church was reconstructed in the 14th Century, the porch being added in the 15th Century.Considerable restoration work was done in 1879 under Mr Ewan Christian - the chancel arch was widened and the box pews removed. The painting on the north wall is a 15th Century representation of St Christopher. The wall was recently extensively repaired as, apart from the ravages of age, the constant stream of traffic past the church had damaged a great part of the wall and some areas had collapsed. Not only did the wall need to be replaced with a reinforced wall, but, owing to the slope of the churchyard towards the road, this wall is also a retaining wall. The bricks used are in keeping with the original wall and the church, and the Victorian coping stones were re-used along the full length of the wall. Some fragments of grave stones have been used on parts of the wall inside the churchyard. When the wall was built, the date and the initials of the then churchwardens were built into it. A fragment of parchment found in the Muniment Room at Ely in 1915 confirmed that in 1613 money had been set aside for the purpose of building a wall. It is planned to build a tablet into the new wall, showing the date of repair and the initials of the present churchwardens. Also built into the wall is the Foundation Stone of the first Church School in Impington. This school was built opposite the church in 1846 on land given by the Reverend Pine-Coffin, then owner of Impington hall. He was a descendant on the distaff side of the Pepys family who built the Hall around 1580. The Hall was demolished in 1953. The diarist Samuel Pepys attended Impington Church when staying at the Hall with his Uncle Talbot. Talbot Pepys was for a time civil registrar and signed the marriage registers. Two of the bells are 15th Century. The treble (by Richard Hille 1423-1440) is the second oldest in the Deanery and has been calling people to Church for nearly 600 years. The tenor was recast in 1925. The tower is unsafe for ringing the three bells 'Full Circle' but the bells are chimed for some Sunday services and some weddings. The niche by the pulpit is 15th Century. It now houses a wooden crucifix made in 1975 by Mr L W Pendred. The roof was restored completely in 1989, with new guttering and downpipes. The East Window was designed and made by Goddard and Gibbs (London) in 1991, and dedicated on St Andrew's Day of that year. The apples and pears in the window are to commemorate Chivers and the sweet peas and gladioli Unwins. Both these family firms have given a great deal to Impington throughout the twentieth century. Congratulations to Violets are blue on the FTF.